After gaining control of the rebellious Ionian Greeks in 495 BC, Darius I of Persia realized that they would be a perpetual bother as long as they could gain help and encouragement from the Greek mainland so he determined to conquer Greece proper, secure his western frontier and lay the groundwork for Persia's expansion into Europe. He was also outraged that during the Ionian rebellion an obscure city-state (Athens) from mainland Greece had assisted in the expulsion of the Persians from Sardes, the capitol of the Ionian Greek city-states. His anger was such that he vowed to punish them and every night at dinner he had a servan repeat to him "Lord, don't forget the Athenians"
Darius had two routes to invade Greece, one by land and one by sea. He chose them both and in 492 BC began his expedition. However, his first attempt failed because a terrible storm destroyed his fleet. Two years later he launched his second attempt, again by sea but with a more southernly route. This expedition resulted in the Battle of Marathon. During the two year interval he sent heralds to the Greek city-states. The heralds, as was the custom, asked for "earth and water" as a token of submission. Many of the Greek city-states acquiesced but many did not, including the two most important, Sparta and Athens. The Athenians threw the heralds off the Acropolis and the Spartans threw them down a well where there was plenty of "earth and water". The Athenians even executed the unfortunate translator of the Persian demand for defiling the Greek language. War was now certain. 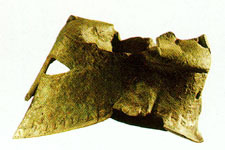 The Persian fleet conveying a force of infantry and calvary sailed across the Aegean Sea in late August or early September of 490 BC. Most of the islands along their route submitted but Eretria did not and was under seige for six days until some of its citizens helped the Persians enter its walls. The city was sacked, its buildings destroyed and its inhabitants who survived the massacre that follwed were taken prisoners. This was in retaliation for the part that Eretria played in assisting Athens in the destruction of Sardis in the Ionian rebellion. This was a clear indication to the Athenians that theirs would be the same fate. The Persian army sailed from Eretria to the Marathon Bay and landed there, about twenty five and a half miles from Athens. The Athenians had sent to Sparta for help but Sparta was unwilling to leave until the moon was full and they were also reluctant to fight beyond the borders of the Pelopennese, therefore Athens stood alone. The Spartans eventually arrived after the battle was over. 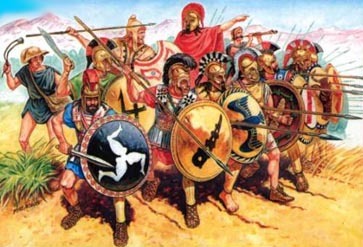 But the Athenians had a most welcome surprise when they arrived at Marathon for they were joined by a force of 1000 Plataians (their entire army) to fight against the common enemy. Athens was eternally grateful for that brave act of the Plataians. Together they would face the Medes and their conquerors, the Persians. No one had been able to stand up against them in the past. The Athenian army took up its position in the Valley of Vrana, outnumbered three to one. The battle lines were about one mile apart and the Athenians did not have enough troops to cover the entire valley. Therefore, their leading General, Miltiades, set a weak center and strengthened the wings. Here were the characteristics of the two opposing armies. The Persian army consisted of infantry and execellent calvary. Their tactics were of a defensive nature since their main weapon was the bow. Their usual tactic was to wait for the enemy to come close and then to "bury" him under a barrage of arrows. 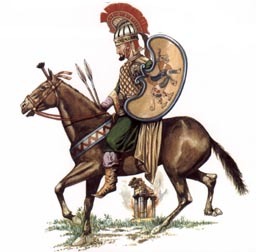 The Greek's army doctine on the other hand was of an offensive nature. 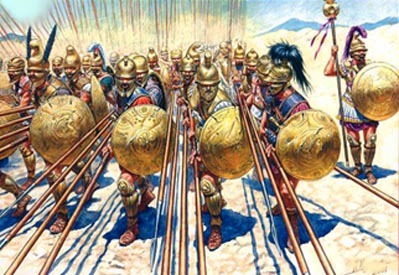 Their main weapon, the long, heavy spear, their heavy armament (helmet, shield, breastplate, greaves) and their battle formation, the phalanx, favored close combat. The Greeks used neither bow nor calvary at this time. 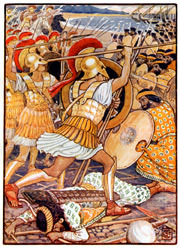 Miltiades attacked at dawn. The Athenians charged at a run. The Persians waited, not really believing that anyoneone could run that far and still fight well. They routed the Greek weak center and charged up the valley. 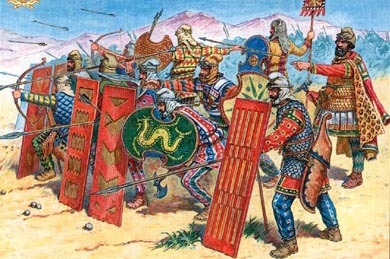 The Greeks retreated, pulling the Persians forward and extending their lines. Then the Greek wings fell upon the Persian flanks while the center suddenly stood firm. The Persians broke ranks and began to retreat. As the Greeks pressed, the retreat became a rout. The Greeks harried them all the way to the beach and followed them into the water, swiming out after the boats and capturing seven Persian ships. The Athenians had won at Marathon but they certainly had not destroyed the Persian army. They had made plans before the battle that if they won, they would get word back to Athens as soon as possible because they knew that the Persian fleet was sure to sail around Attica and attempt to take the city while it was undefended. The citizens were to man the walls and make it appear that Athens was strongly defended. Miltiades sent a young soldier (probably Phaedippas) to take word back to Athens. He ran the entire distance, 42.192 kms, shouted "We have won!" and fell dead of exhaustion. In memory of this event the Marathon Run was included among the contests since the first contemporary Olympic Games. The Persians did indeed sail around Attica hoping to find the city helpless but when they met with resistance, they hesitated. Not long after, the Greek army arrived. The Persians decided they had enough of these Greeks and sailed home. The Battle of Marathon is perhaps the single most important battle in Greek history. 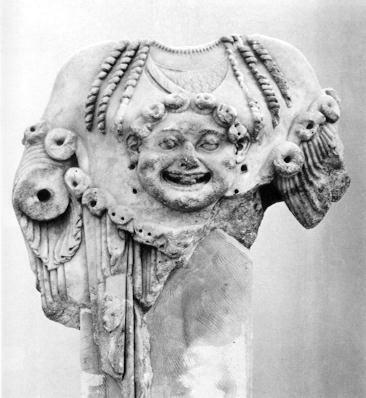 Had the Athenians lost, Greece would have eventually come under the control of the Persians and all the subsequent culture and accomplishments of the Greeks would probably not have taken the form they did. However, the Persian were not finished. 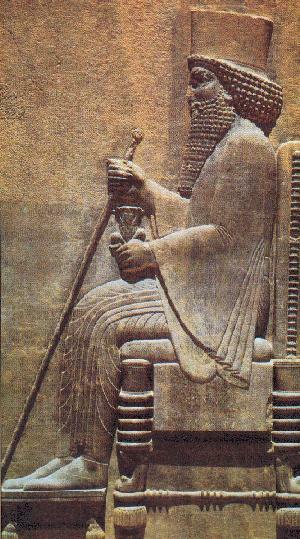 In 481 BC, Darius I's son, Xerxes, gathered together an army of some one hundred fifty thousand men and a navy of six hundred ships. He was determined that the whole of Greece would be conquered by Persia. The Battle of Marathon immortalized the name of Miltiades; but in a few years' time he fell from his high estate, for he failed in an expedition against the island of Pa'ros. The Greeks had no pity for failure. As they hooted against unsuccessful atheletes in their games, so they jeered at Miltiades. In spite of all the honors they had recently heaped upon him, the people hearkened to his enemies when they said his failure was due to criminal conduct of some kind. He was called up for trial, though he was wounded and forced to appear before his judges on a couch, he was fined fifty talents of silver, and when he could not pay the debt he was cast into prison to die. 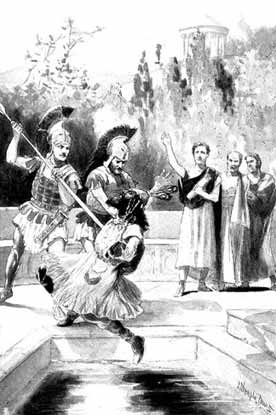 So ended the life of Miltiades. Such was the gratitude shown by the Greeks to the hero of Marathon.